Jim and Connie Fickel first became manufactured homeowners in 2010. Before that, they had only lived in site-built homes. And like so many other stories we’ve shared over the years, the 2008 recession hit the couple hard and forced them to find a less expensive housing choice. They found a 1991 Fleetwood triple wide with about 1800 square feet in a park for $59,000. That’s only $32 a square foot! The 1991 Fleetwood triple wide remodel started before the couple even moved in. 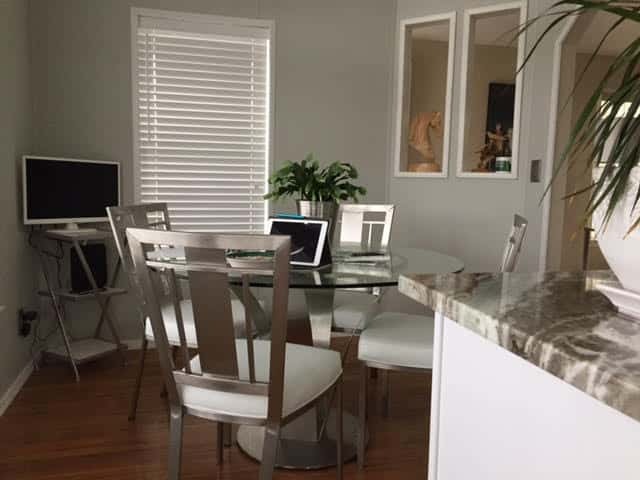 Connie spent the 30 days between close and move in painting and texturing the entire interior and installing vinyl panels in the kitchen, both baths, and the laundry room. The original kitchen had an upper cabinet divider between the kitchen and dining nook that was removed almost immediately. The kitchen after Connie painted it but before the complete gut. The original kitchen cabinets were painted a bright sky blue and the Formica was pretty beat up. As soon as the couple moved in Connie did a temporary kitchen remodel. 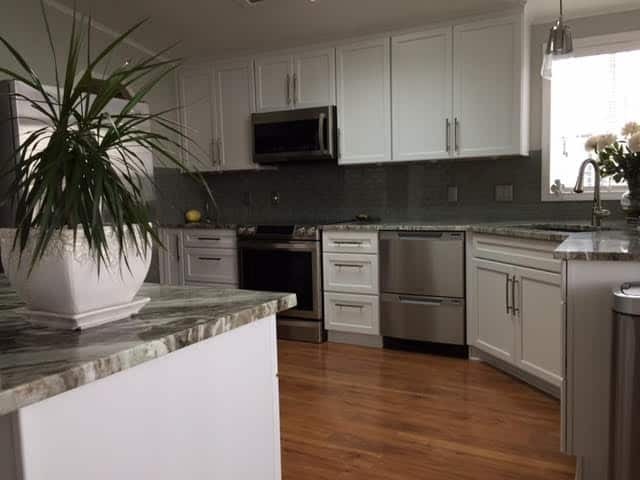 She painted the cabinets white, tiled the countertops, and installed a new backsplash. 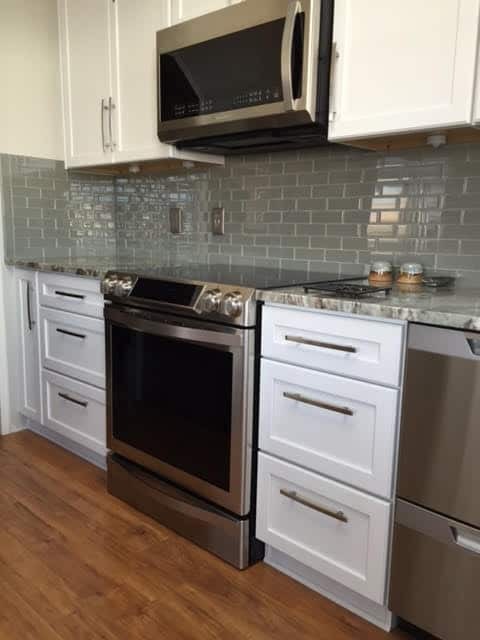 New appliances were later added. Related: Read how to repair and paint mobile home kitchen cabinets here. The Fickels also removed the faux stained glass panels in the entryway. To give the home a more modern look, Connie removed the hutch with the dated faux stained glass. The faux stained glass panels were removed to open the space up. 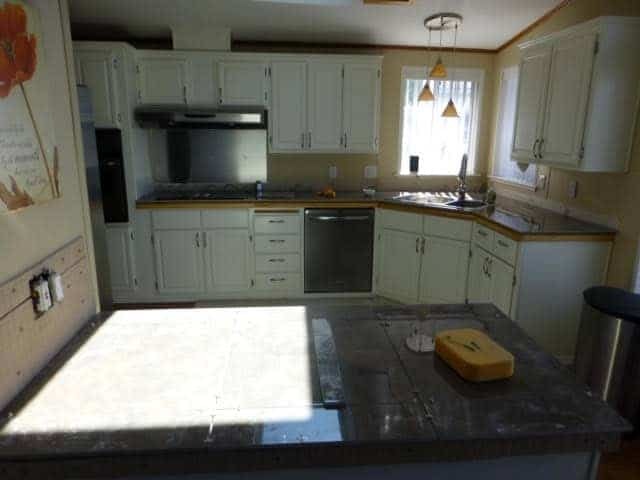 Here’s the kitchen after Connie’s first update but before the ‘big’ kitchen remodel. In 2016 Connie got her dream kitchen. When Connie’s business bounced back from the recession in 2016, they had their dream kitchen installed. 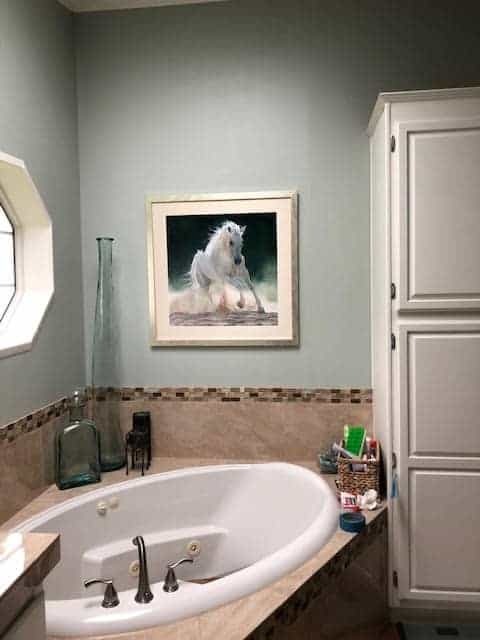 Of course, it’s their favorite room! See 6 more great mobile home kitchen remodels here. 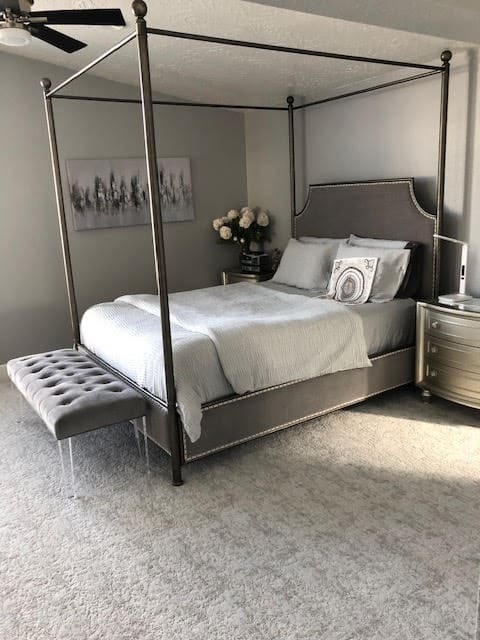 What a beautifully cozy bedroom! New flooring is a must-have for homeowners remodeling a home or just giving it a fresh new look. 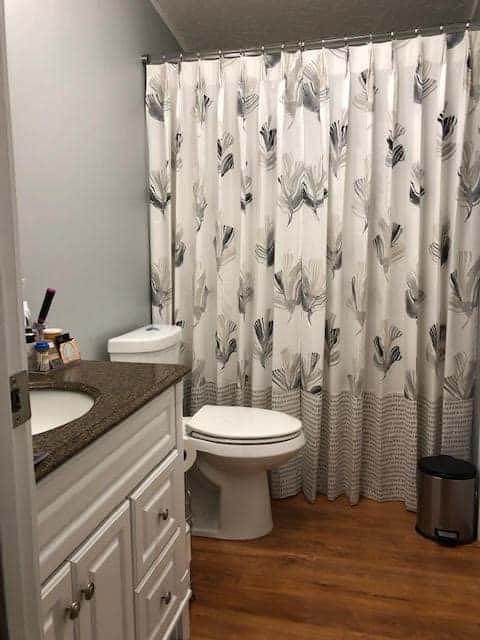 In addition to new flooring, the couple also added new baseboards and door trim in the bath. Read more tips to remodel your mobile home bathroom here. We asked Connie what her biggest challenges were and she said it was price shopping and finding good contractors at a fair cost. The exterior updates on this 1991 Fleetwood triple wide are especially awesome. The triple wide had already been on its leased lot for 19 years and the landscaping had been neglected. First, the home’s shingles needed to be replaced at a cost of $6,300. Secondly, and much more aesthetically pleasing, was landscaping and replacing the front deck. The Fickels removed dead and dying plants and the broken down trellis. 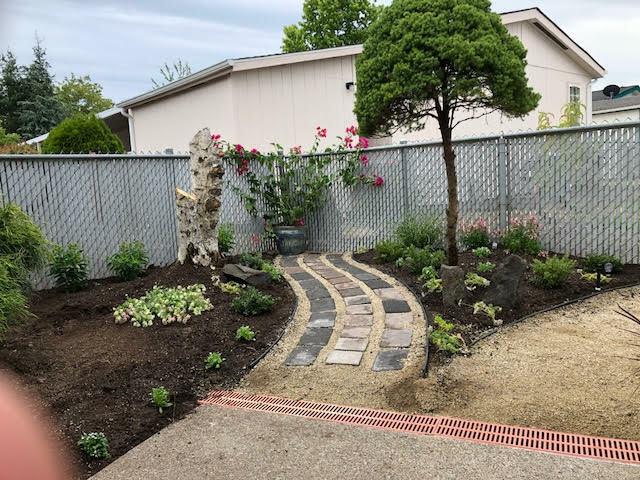 They also repaired the sprinkler system and replanted the grass. The end result is great. The couple designed a gorgeous deck. Though it was a bit of a splurge at $12,000, it is a knockout! The deck is a knockout. We especially love this 1991 Fleetwood triple wide manufactured home and that deck is one of our favorites. It’s a beautiful entrance and gives the home a structural significance that many manufactured homes lack. 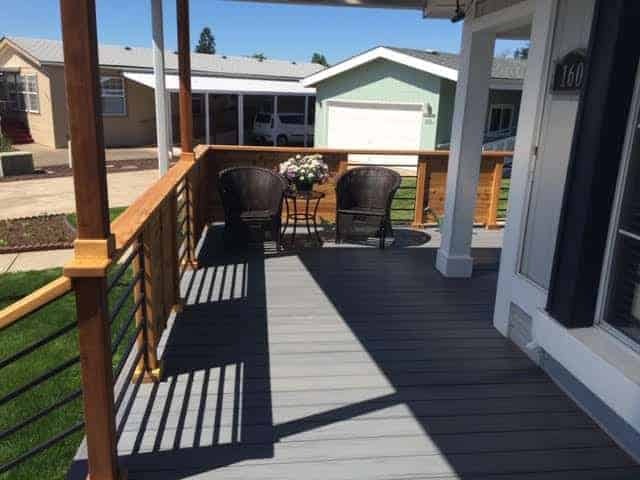 Wrap-around decks are one of the best ways to make a manufactured home look like a site-built home. 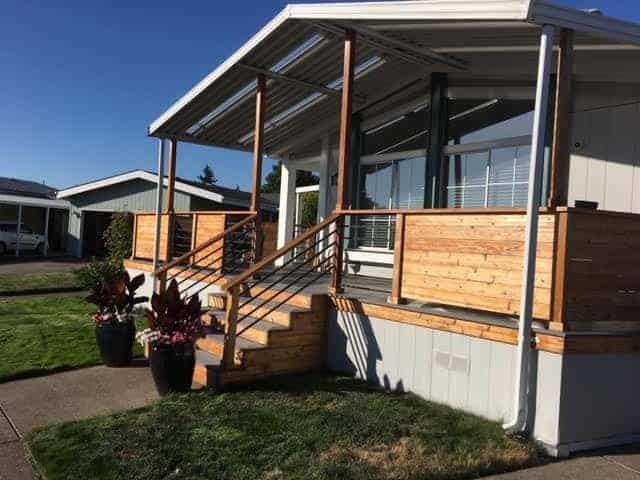 In all, Jim and Connie paid almost $59,000 for the 1991 Fleetwood triple wide manufactured home and have invested about the same amount on upgrades and remodeling. 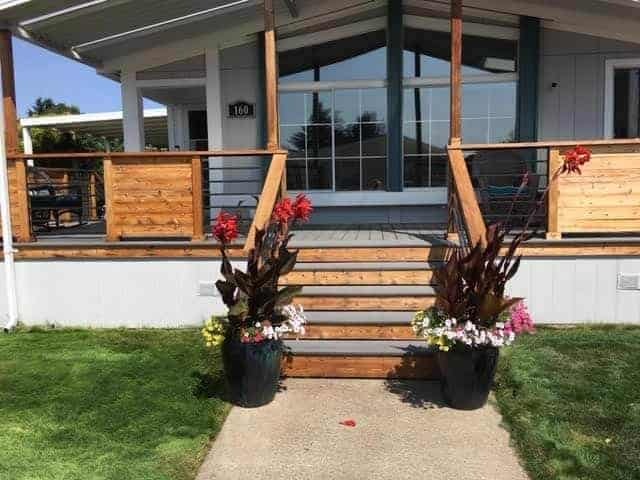 Connie and Jim live in a gorgeous home with an investment of around $100,000 and for the Oregon area, this is a great price. The average sales price for a three bedroom home in Eugene is $299,999. Connie says they are good with that. Homes in their park are selling at 2 to 3 times the amount they sold for in 2010. Some homes are updated, others not, so Connie feels their investment is good. Especially, since they plan to stay there as long as physically possible. Have never heard of a triple wide. This home is beautiful and tastefully done!